One day, perhaps, murderously corrupt police officers will once again be a viable source of comedy. 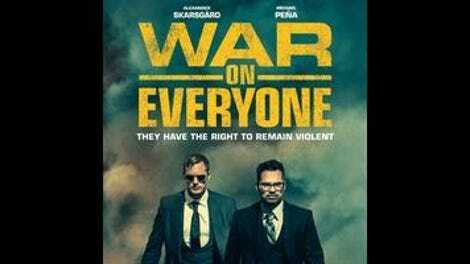 At this particular historical moment, however, a movie like War On Everyone has its work cut out for it. The very first scene attempts to get laughs from cops who deliberately run over a fleeing suspect, after he’s stopped running and clearly decided to surrender; it’s supposed to be funny simply because the suspect is a mime. (“I always wondered: If you hit a mime, does he make a sound?” “Well, now you know.”) Later, one of the cops, asked why he joined the police force, answers “I guess I always wanted to pervert the course of justice. Plus you get to shoot people for no reason. Nobody can do a goddamn thing about it.” Pitch-black comedy along these lines worked as recently as Bad Lieutenant: Port Of Call New Orleans, right? Today, such behavior approximates real-life headlines so closely that it’s hard not to just feel queasy. It’s not as if writer-director John Michael McDonagh hasn’t mined this territory successfully before. His first feature, The Guard (2011), was also about a corrupt policeman, memorably embodied by Brendan Gleeson at his irascible best. (Gleeson then switched gears to play a super-compassionate priest in McDonagh’s second film, 2014’s Calvary.) But that film had a tempering influence in Don Cheadle’s straight-arrow FBI agent. Here, both Bob Bolaño (Michael Peña) and Terry Monroe (Alexander Skarsgård)—partners in the New Mexico State Police force—are complete scumbags, interested solely in using their badges to make money and inflict pain. The movie’s threadbare narrative involves their efforts to muscle in on a million-dollar heist being planned by a foppish British lord (Theo James), with the intention of keeping the loot themselves. But that’s really just an excuse for free-floating cheerful hostility, supplemented by a tepid romance (Terry falls for an ex-stripper, played by Creed’s Tessa Thompson) and a subplot about an orphaned kid that clearly exists in order to exonerate the film from charges of nihilism. 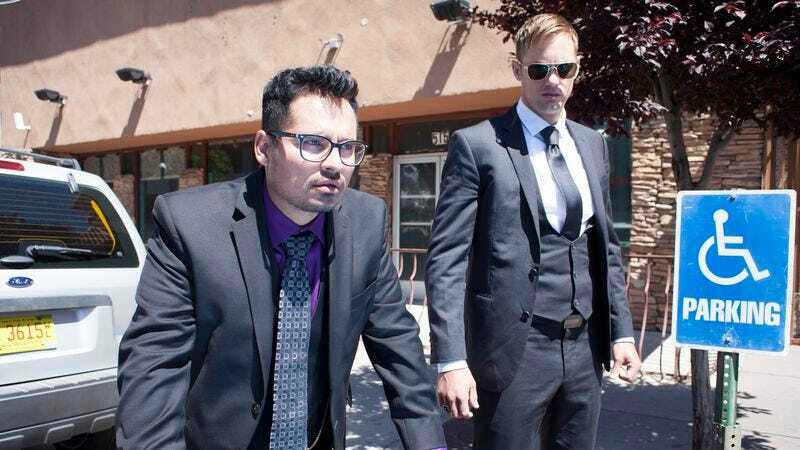 War On Everyone’s saving grace is its freewheeling refusal to commit to any particular tone, including the rancid one that generally dominates. McDonagh enjoys goofy non sequiturs so much that he’ll fly the whole crew to Iceland just for a quick bit about Bob and Terry tracking down someone who’s reportedly fled there with the money. Peña, who does a terrific deadpan, spends much of the movie randomly spouting Cliff Clavin-style factoids, which is far more amusing than, say, Terry’s no-fucks-given penchant for deliberately ramming parked cars as he drives down the street. Even the film’s needle drops are all over the place: There’s a crowdpleaser that verges on cliché (M.O.P.’s “Ante Up” accompanying badass hijinks in the opening credits), one character’s indie-quirky obsession with an ostensibly uncool musician (Glen Campbell, in this case), and a surprisingly lovely montage of Terry searching for the orphaned kid at night, set to French-Italian chanteuse Catherine Spaak’s 1964 ballad “Non È Niente.” Should something be off-putting, just wait a few minutes, if that, and it’ll be supplanted by something else. That won’t eliminate a nasty aftertaste, but it’ll help.